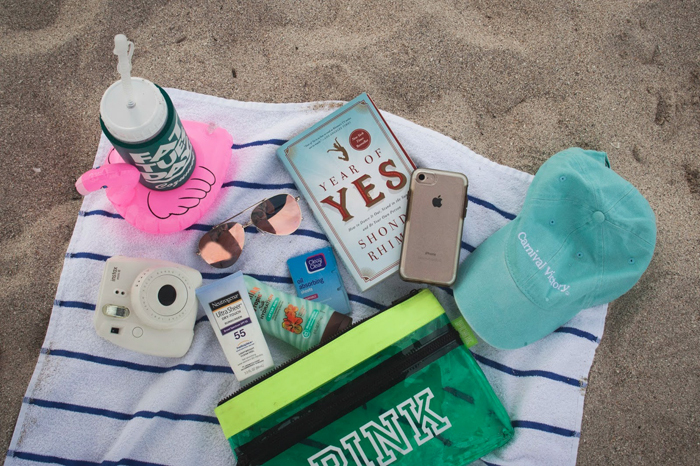 A good book is the most obvious essential for any beach vacation. What else would you do when you're laying on the beach tanning? I hardly ever have time to read except when I'm on vacation. There is nothing quite like the feeling of laying on the beach in the warm sun while reading a great book. Some of my favorites as of late are: Year of Yes, The Subtle Art of not Giving a F*uck, and You Are A Badass at Making Money. I like to keep my book in a ziplock bag or a zipper pouch to keep it from getting damp. I'm all for a good tan, but my pasty skin does not like being in the sun very much. Even when I lay out to tan, I wear sunscreen. I still get a tan but I get way less burned than usual. I think it's so important to take care of your skin when you're young to keep it looking good when you're old! Just in case I do get burned, I love this Hawaiian Tropic After Sun Lotion. Nothing soothes a burn quite like this. I love the smell and it is so moisturizing! Regular aloe is sticky and gross feeling on your skin when it dries, but this leaves no residue behind. Baseball hats are literally my favorite thing in the entire world. I wear one almost every single day, not just when I'm on vacation. I think it's super important to bring a hat to the beach with you even if hats aren't your thing. Nothing hurts more than a sunburned scalp, trust me. After the sunburn fades away, your dry skin flakes off and it looks like you have dandruff! You can avoid all this by simply wearing a hat when you're in the sun. It will also protect your face from getting burned. Maybe it's the photographer/blogger in me speaking, but I constantly have a camera with me. I like to keep my DSLR in the hotel room so it doesn't get stolen, but on the beach I take pics with my phone or Polaroid camera. I also bring my GoPro swimming with me to get some cool pictures and videos! This might not be an essential for everyone, but it definitely is for me. 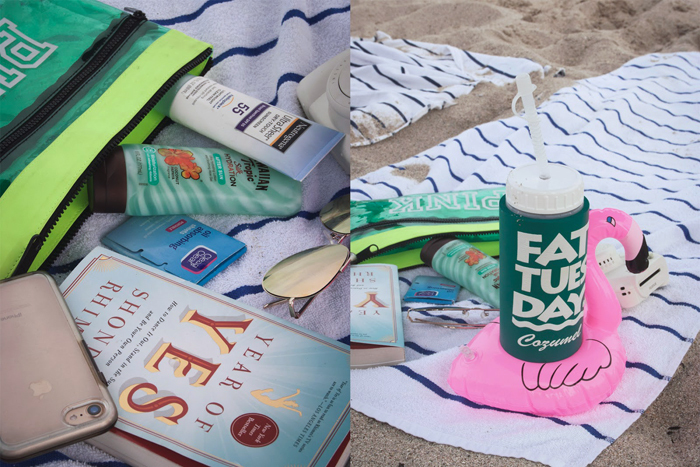 What is a day on the beach without drinks? Since most beaches don't allow glass bottles, I like to pour my drinks in a plastic cup before I leave my hotel room. This reusable cup from Fat Tuesday in Mexico is seriously the best. It has foam insulation around the cup so it stays cold for a long time. I also love that it has a cap on the straw so sand doesn't get into my drink. 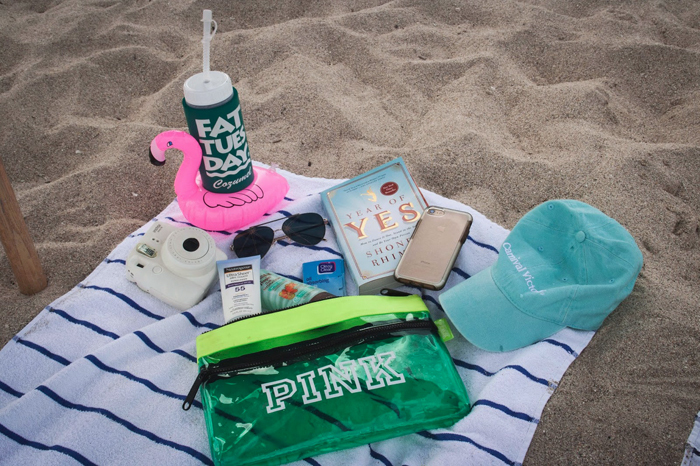 Another thing I bring is a cute flamingo floatie...not necessary, but it's so cute for Instagram pictures! I take my phone with me everywhere, so the beach is no exception. I like to bring headphones so I can listen to music or podcasts when I'm taking a break from reading. I don't like to have my headphones in for very long though. I love listening to the sound of the ocean waves crashing on the beach, it's my favorite thing in the world! My eyes are super sensitive, so I'm always wearing sunglasses. I always bring a cheap pair to the beach because there is such a high risk of them getting lost or broken. Plus, I like to wear mine in the water when I'm swimming. If I wear a cheap pair, I don't have to stress if they fall off and get lost! The ones pictured are from Steve Madden and they were only like $30. They are the most perfect pair of aviators! This is obviously something you need to bring with you so you can dry yourself off after swimming or so you have something to lay on! I don't recommend packing towels in your suitcase though. They take up a ton of space and it's super unnecessary. Every beach hotel I've stayed at has free towels available for you to use during your stay. If you get there and for some reason they don't, you can always run to Walmart and buy a cheap $5 one. 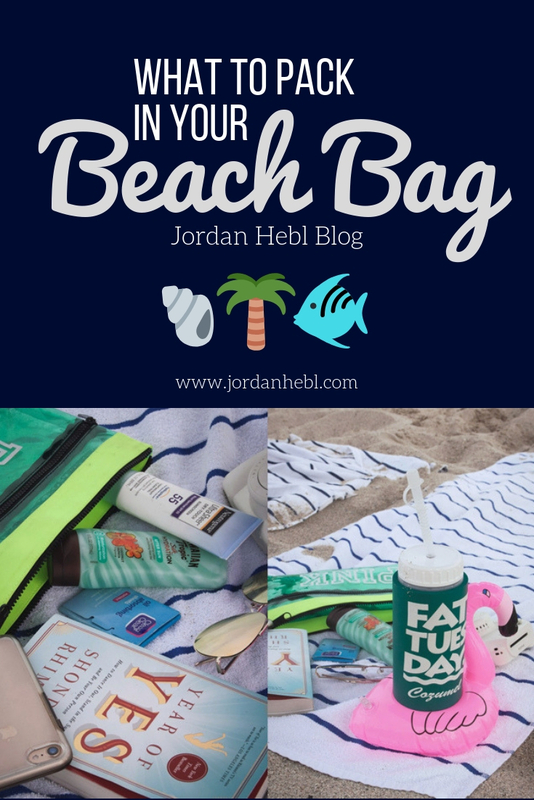 The last thing I keep in my beach bag is some kind of small zipper pouch or makeup bag. This green pouch I have is from Victoria's Secret and it does the job perfectly. It is made from a thick plastic and has two zipper compartments. 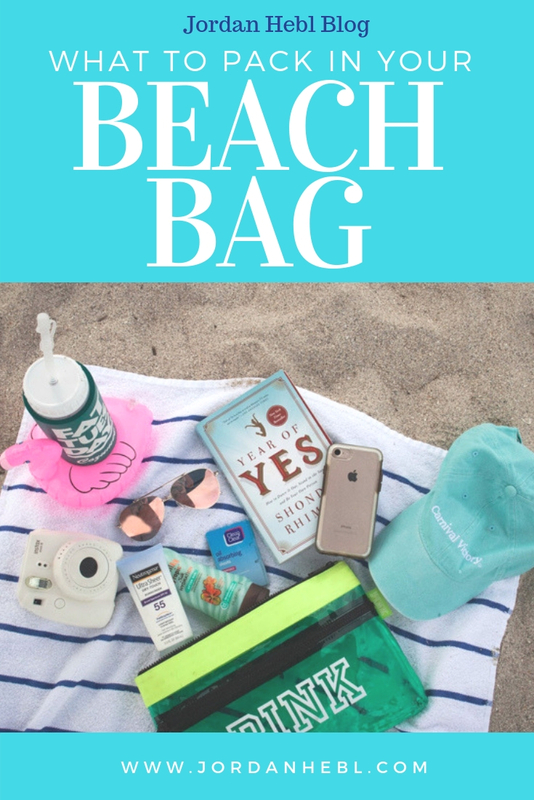 I think it was made to hold wet swimsuits, but I put my phone, headphones, camera and book inside so they don't get wet and sandy! HERE is a link to a super cute pouch. 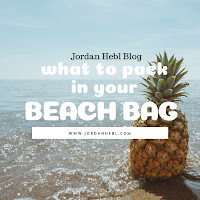 Leave a comment down below telling me your beach bag essentials and also where you are going for Spring Break!